Should have gone to the photography group that I have just joined in Leicester tonight but I have a bout of pleurisy flaring up at the moment and didn't want to risk being in so much pain that I couldn't drive home, so I didn't go. Can you believe that my Doctors surgery was closed this afternnon for training purposes? I was given an out of hours number to ring as I need anti-biotics. I think I'll try to wait until tomorrow and try the surgery in the morning as I don't feel ill enough to call a locum out at night, unless it gets a lot worse! 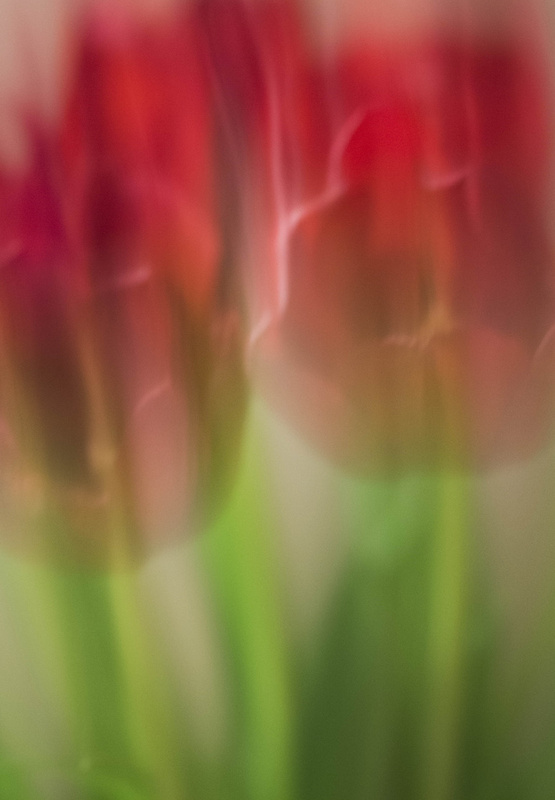 Anyway, I decided to take a photo of my tulips but use ICM (intentional camera movement) for a change. I quite like how it came out although I know a lot of my followers won't. shepherdman is one of those. He passed by and said 'you're not putting that on are you? much to arty farty for me! Well, each to his own! Love the vibrant colors here. Gorgeous!!! Very cool shot love the art's fartsy look..........it might be because my husband is an artist! Looks like a painting that's run in the rain, love it. @pixiemac I had pneumonia this time last year. I had 3 lots of antibiotics before they got rid of it. The first 2 were amoxycillin (penicillin) which the pneumonia was resistant to. The third one was a tetracycline which works a treat. I am given that now for every chest infection I get. I am also given twice the length of time on it too as I have been diagnosed with COPD. I've just been given the pneumonia vaccination too. That might be worthwhile you asking for once you are better. Thanks for the fav and hope you have a speedy recovery. Superb ICM. Hope you feel better soon, poor you not nice at all. I was given Clarithromycin when I had a stubborn chest infection. I like the artistic look, and I like the idea of spring! Yeah well I happen to like arty farty. Instant fav when I saw it! I'm still trying to figure out how to do this icm. Can't seem to get the hang of it with my Nikon. Any suggestions would be immensely welcome! I like the way the colours blur and blend into each other. Interesting effect. Hope you feel better soon. Really effective shot Chantal. My husband (who also likes to take photos) is always pointing out bits of rust and things with 'texture' for me to photograph but they just don't do anything for me although they look great when other people do them. I just say do a 365 project and you can take pictures of rust and texture. He would quite like to do it but the commenting puts him off!!! Ps Got so carried away with my long comment I forget to say hope you feel better soon. @paulaw It took @shepherdman a year to persuade me to do 365, now he can't get me off it! It is all consuming, highly addictive! Love it. Tell your other half that he doesn't have to comment if he doesn't want to. You make what you want out of 365. It is your own project to do what you like with. He should try it! @shepherdmanswife In fairness he works very long hours but I may be able to convince him to try it once he retires in a few years time! Btw so glad he convinced you Chantal, you take such great photos and I've really enjoyed following your project. @paulaw Thank you Paula. Yours are wonderful too! Gret colors and I blur effect! Beautiful colors! I'll have to give this a ago! Feel better soon! I had pleurisy once & don't ever want to have it again! Stunning image -- it's a great abstract with wonderful colors. Disagree totally with Shepherdman! This is lovely! Great colours and love it's arty farty ness! A beautiful image, I love the colour and I'm sorry that Shepherdman appears to be such a poor judge - FAV for me! I'm all in on this one too. Nice impressionist design. Feels like Renoir to me. Sweet!!! I have really been loving ICM lately! Love this one! This arty farty turned out very nicely! Beautiful colors and I love the abstract look of it. I really like the effect! I hope you feel better soon! FAV... I love tulips and this effect looks so cool! Gorgeous picture. Congratulations on making the Trending Page. Well, I like your arty farty post! Love it actually. Hope you are feeling much, much better soon. A great ICM shot, and love the colours. I have been in bed since Wednesday with Bowl trouble, get better soon. Fantastic! I can never pull these off but I'll keep trying until I get one I can post! Ah don't listen to Shepherdman - I think it looks really cool - just enough detail to know what it is, yet very soft and arty. So this is the way to shoot those tulips, fabulous effect! The blended colors are lovely. Wow loving this ICM, fav! I really love it, fav for me! Hope you're feeling better soon.